We are very happy to invite our members, observers, and friends to the 95th Spring Meeting of the American Association of Variable Star Observers. This meeting will be held in Rockford, Illinois, from May 4th to May 6th, 2006. We have many interesting events planned for this meeting, including: a tour of Rockford for early arrivals, an informal observing night, a workshop on scientific paper writing, a "Starbeque" and open house at Lockwood Observatory including a public lecture by Dr. John Percy, the AAVSO membership meeting, two AAVSO scientific paper sessions, and a visit to Burpee Museum of Natural History for the closing banquet with AAVSO awards presentations. Our hosts for this meeting are Barry and Carol Beaman and their local astronomy group, Rockford Amateur Astronomers (RAA). Barry is a current AAVSO council member and both Carol and Barry are regular AAVSO meeting attendees. We thank Barry, Carol, and the RAA for their help in putting together this exciting meeting! 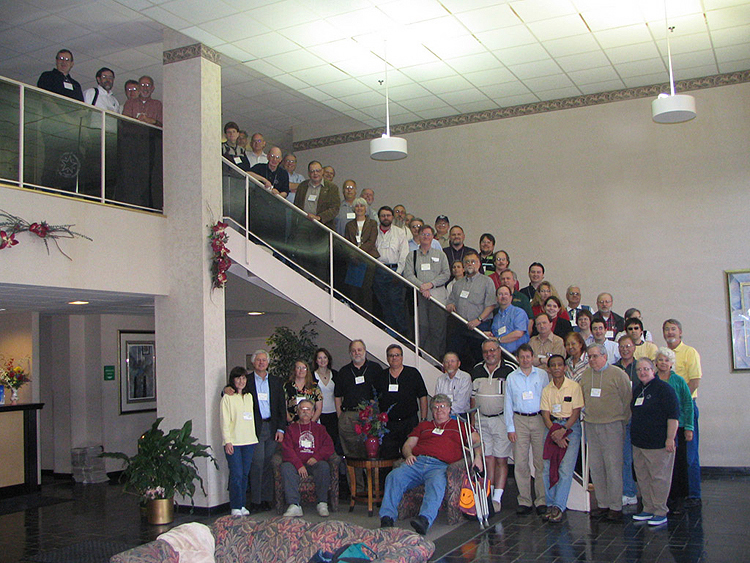 AAVSO meetings and workshops give both newcomers and longtime attendees the opportunity to share ideas and experiences. Attending these gatherings is also an excellent way to learn about and keep up to date on the many activities and accomplishments of the Association. Whether you have attended dozens of AAVSO meetings or are a first-time attendee, we hope to see you in Rockford for the 95th Spring Meeting of the AAVSO. This is sure to be an interesting and enjoyable event. Tour of Rockford: On Thursday, May 4th local host Carol Beaman will be leading an informal tour of Rockford for any interested early arrivals. Rockford is large enough to be quite rich in attractions and culture, but small enough to be inexpensive and uncomplicated, making it an ideal location for our meeting! Experience the big city attractions with the no-hassle small town feel (and prices!) that Rockford has to offer. Join Carol and explore some of Rockford's museums, galleries, markets, or gardens. Participants will be encouraged to caravan and seats for those without cars will be assigned on a first come, first served basis. There is a space on the registration form to indicate that you would like to receive further information on this tour as the itinerary is finalized. Informal Observing Night: Sign up sheets will be available at the meeting registration table during the day on Thursday, May 4th for those interested to sign up for observing (weather permitting) at the home of the Rockford Amateur Astronomers, Lockwood Park Observatory, on Thursday night. This facility houses a custom built 10" Astro-Physics refracting telescope, a 10" coelostat solar telescope built by RAA member Walter Piorkowski, and several portable scopes of various sizes and configurations. Workshop, Writing and Publishing Scientific Papers: On Friday morning, we will hold a workshop on Writing and Publishing Scientific Papers, to help amateur observers, students, and teachers interested in performing and publishing their own astronomical research. It will cover the basics of scientific publication, including: elements of content and style of scientific papers, the hows and whys of literature searching, creating effective and informative graphics, and how and where to submit your work for publication. We will end the workshop with a panel discussion with both professional and amateur researchers. Lockwood "Starbeque", Open House, and Public Lecture: Friday evening, May 5th, Barry and Carol Beaman and other members of the Rockford Amateur Astronomers (RAA) will host a "starbeque" and open house at Lockwood Park Observatory, the observing home base of the RAA. The evening will also feature a public lecture given by longtime AAVSO member, Dr. John Percy. Maps/directions will be available at the registration table. Transportation will be provided for those without cars. Membership Meeting: All attendees are invited to this gathering, which will be held from 9:00 am to 12:00 pm on Saturday, May 6th. The purpose of this meeting is to inform attendees of the activities of the Association, and will include reports from the Secretary, Treasurer, Committee Chairs, and the Director. Museum Tour, Banquet, and Awards Presentation: This year the Awards Banquet will be held at Burpee Museum of Natural History on the evening of Saturday, May 6th. As an extra treat attendees will be free to view the museum's exhibits before dinner. The newest permanent exhibit at Burpee has stirred up quite a bit of excitement. Jane: Diary of a Dinosaur explores the history of a young T. rex skeleton found by Burpee researchers in Montana. Jane has been called one of the most important dinosaur discoveries in the last 100 years. Other exhibits include a hands-on exploration of the River Rock Valley, the geoscience of glaciers and volcanoes, the history of humankind in North America, and a 2-story tall prehistoric coal forest complete with tropical rainstorm! The banquet will feature a choice of Grilled Bistro Filet with Burgundy Mushrooms, Salmon with Mustard Sauce and Spinach, or Vegetarian Basil and Parmesan Bows. Dinner will be followed by an awards presentation. Transportation will be provided between the Holiday Inn and the museum. Attendees with cars are free to drive to the museum, which is only about 15 minutes away. Maps/directions will be available at the registration table. Following the awards presentations at the banquet, Karen Meech will give a talk entitled, "Deep Impact - Secrets of the Comet". On July 4, 2005, the NASA Deep Impact mission impacted comet 9P/Tempel 1 at a velocity of 10.3 km / sec, and excavated nearly a million tons of dust in the process. A major world wide observing effort - both professional and amateur - complemented the event, the largest coordinated astronomy event we have ever had. The comet had both similarities and major differences from the 3 other comets we have flown close to. In this talk I will show movies of the impact and share with you some of the exciting mission results, which are re-shaping some of our ideas about comets and solar system formation. I will also give a personal insight into what it was like to participate in a large mission like this, and to be, if only for a moment, in "control of Earth" - well the Earth-observing campaign, that is! I will also share some information about new planned missions based on Deep Impact ideas and tell you how you might participate. Sleeping rooms have been reserved for AAVSO meeting attendees (at special group rates) at the Holiday Inn of Rockford. Please make reservations by calling the Holiday Inn at 1-800-383-7829 or 1-815-398-2200 before April 3rd, 2006. Rooms in the AAVSO block will be released and the group rate may no longer be available after this date. Please be sure to mention that you will be participating in the AAVSO meeting when making your room reservations. LOOKING FOR A ROOMMATE? Anyone interested in sharing a room during the meeting should complete the roommate section of the registration form. We will collect this information and then forward the list, including contact information, to everyone in need of a roommate. We cannot guarantee that there will be a match for everyone, but this could be a useful way to help cut meeting costs. Please return the registration form along with payment in US funds no later than April 24th, 2006. After this date the early registration rate will no longer be available and some functions may be sold out. Please send your form and payment to: AAVSO, 25 Birch St., Cambridge, MA 02138, USA. The registration form will also be posted on the AAVSO web page. Hotel local shuttle: The Holiday Inn provides its guests with a complimentary local shuttle which services the 7 mile radius around the property. Rockford does have an airport with limited service. The Holiday Inn provides free shuttle service to and from the Rockford airport. Visit the airport web site at: www.flyrfd.com for more information on service to Rockford. Visit www.flychicago.com for further information on airlines and rental car companies servicing O'Hare and Midway airports. Coach USA (Van Galder Bus Lines) provides daily shuttle service between Rockford and both O'Hare and Midway airports. The O'Hare shuttle costs $15 each way, has 17 trips daily, and stops at the Holiday Inn. The Midway shuttle costs $19 each way, has 7 trips daily, and stops at the Van Galder Terminal. The Holiday Inn local shuttle can be called to pick up/drop off attendees at the very nearby terminal. Rental cars: Below is a list of rental car agencies that service both O'Hare and Midway airports. May 4th - Meeting begins — Welcome to Rockford!